Good Works to Enter Paradise? Muslims like to tell potential converts that Allah is clear on his requirements for anyone to make it into Paradise, where 72 virgins and rivers of wine that won't get you drunk await. Forgetting for the moment how this is a version of Paradise that would make even Hugh Heftner blush and also forgetting for the moment how drinking alcohol of any kind is considered a sin, regardless of whether or not it gets you intoxicated. The Quran basically says good deads will get you to Paradise. All of this sounds great until you go to Sahih al-Bukhari are considered the most authentic book after the Quran. They teach you how to be a good Muslim and everything you need to know about your prophet Muhammad and what he said. Oh you poor poor Muslims betrayed by your own holy book and prophet. One side of his mouth, he tells you good deeds gets you into paradise on the other he says it won't. Now why would anyone go for Allah who speaks out of 2 sides of his mouth? Instead follow the God of Israel who said clearly everywhere in the Bible that if you believe on Jesus you have eternal life in Heaven. When asked:"Are you sure that when die, as a Muslim, will you go to be with God, in Heaven? Are you sure of that?" No Muslim has that kind of assurance. No Muslim, because the Quran doesn't give this assurance to any Muslim. And then the Quran, in very plain words, you see, says that every Muslim, every Muslim must enter hell. Ironically the Quran is very emphatic in telling the Muslim that every Muslim will enter hell. This is strange since the ultimate goal of converting is to avoid the fires of hell. Man says: "What! When I am dead, shall I then be raised up alive?" But does not man call to mind that We created him before out of nothing? And certainly We know best those who are most worthy of being burned therein. Not one of you but will pass over it: this is, with thy Lord, a Decree which must be accomplished. What does this mean? Allah must send every Muslim to hell. Of course, when you go to the clerics and ask them, "What do you think about that?" and they say, "Yes. Every Muslim will go to hell for a time until he serves his time, and then he'll go to paradise." But according to the Quran, anyone who will enter hell, will be there eternally. Again the poor Muslims have been lied to. They are here told that they have to go to Hell. But then the Quran says that stay is permanent. 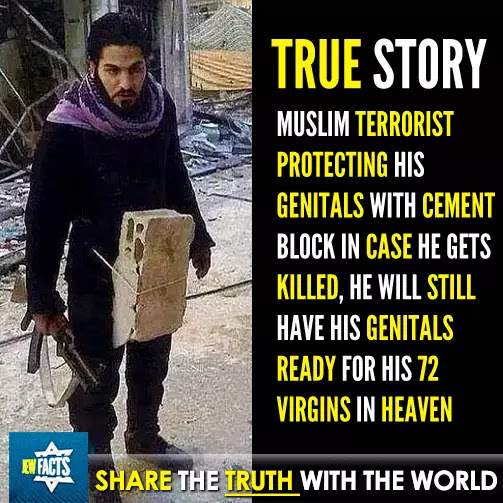 So there is no Paradise of 72 virgins and wine for any of them. There isn't even a promise by Allah that he would let his own Muslims out. Assurance. Assurance. The disciples came to Jesus rejoicing. All, even Satan, obey the commandment when we tell them to get out of any possessed person. And Jesus said, "Do not rejoice because Satan is under your authority. Rejoice because your names are written in Heaven. Rejoice because you have eternal life. On the other hand, the Bible, clearly gives eternal security to whomever will believe upon Jesus as Savior. When you come to Jesus Christ, and the gospel of John 5:24, "if anyone hears my voice, and believes on the one who sent me, he'll have eternal life" He will not come to judgment. He is transferred from this to life. That is the most important." So when you go to the New Testament, and you go to the Quran, in the Quran there is no assurance whatsoever, of any Muslim of going directly to paradise or Heaven after death. On the other hand, in the Bible, it is a guarantee. If you believe with your heart, that Jesus Christ died for you on the cross of Calvary, receive Him as the only begotten Son of God who died on your behalf, you'll receive eternal life immediately, and it will be eternal. That is the difference between the two. If you'd like to put aside all this nonsense, from the fickle god Allah who drags even his own believers into Hell but then says you have to stay in Hell forever, you can start by believing in the Jesus of the Bible who was God himself and care enough to die for you take you directly to Heaven when you die permanently. Pray this prayer and start believing.